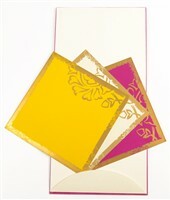 D-3662, Cream Color, Designer Multifaith Invitations. The front of card has Hot Pink color silk screen printed background all over with motif design in gold. The inside pocket holds the inserts. 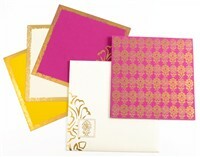 Each insert has different color background as Hot Pink, Yellow and Cream color with golden design printed over it. Envelope too follows the motif design. 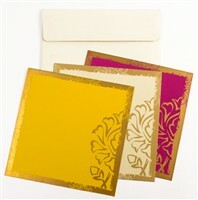 Cream self textured paper (275gsm) for Card, Interleaf, Envelope and3 inserts. Silk screen printing in Gold and Pink color.